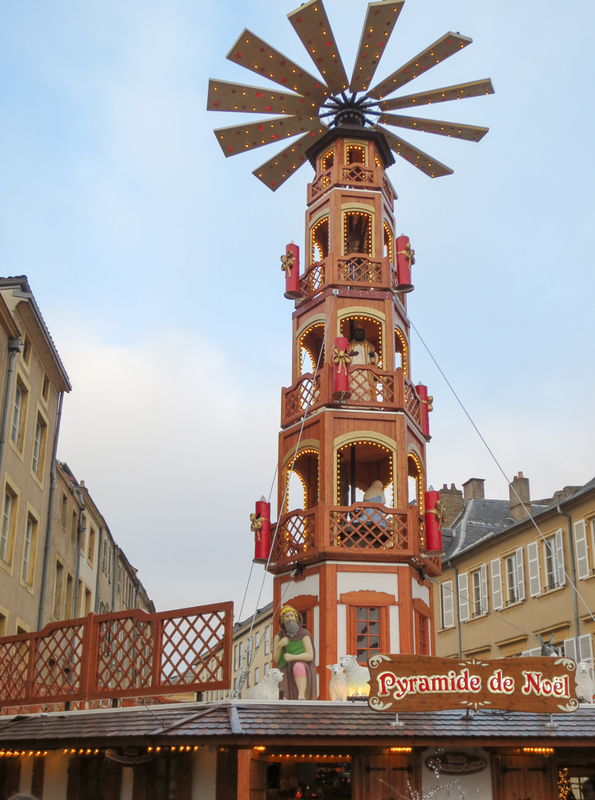 Metz isn’t far from Luxembourg — less than an hour due south by car or by train. In Luxembourg, its Christmas Markets are well-known but not as popular as those of Trier. With friends willing to join us this year, it was finally time to see them for ourselves. A Nativity scene! 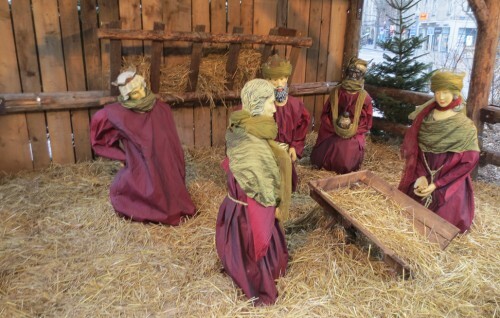 A manger! 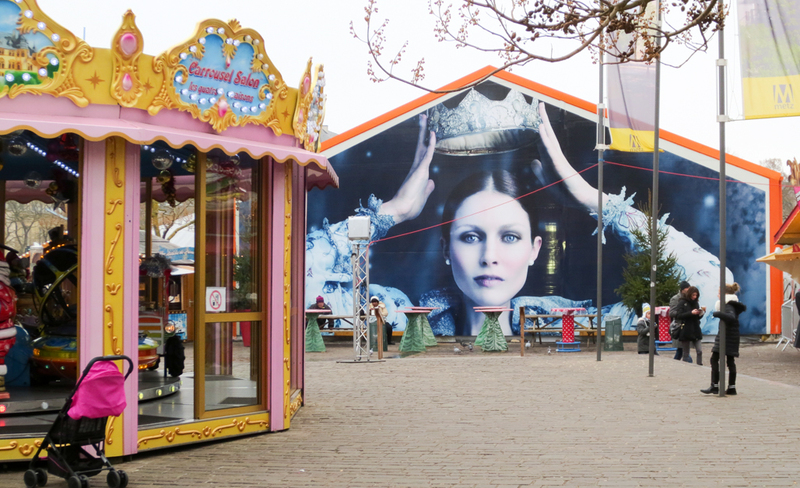 A crèche — in a public space in France? Surely not?! 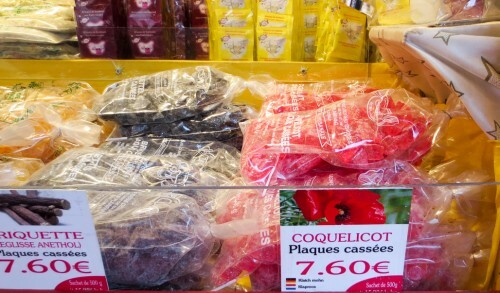 This time of year, France’s extraordinary commitment to laïcité becomes obvious in contrast with its neighbors. Most of Germany and Luxembourg celebrate Christian holidays through public and even government-sponsored events and displays. France observes a principle called laïcité that enforces a strictly secular character to its political affairs through both formal and informal prohibitions. In some ways, it goes well beyond the idea of “separation of church and state” that is well-known to Americans. One fundamental formal commitment to laïcité is a law of 1905. 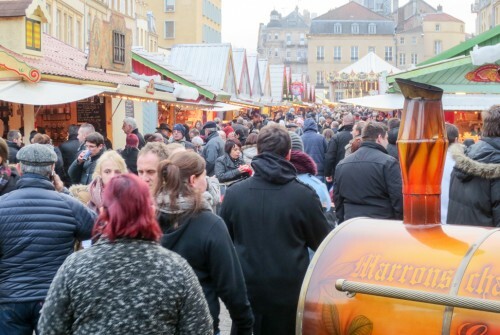 But Metz, part of the Alsace-Moselle region, had been annexed by Germany in 1871 and wasn’t part of France when the law was put into effect. 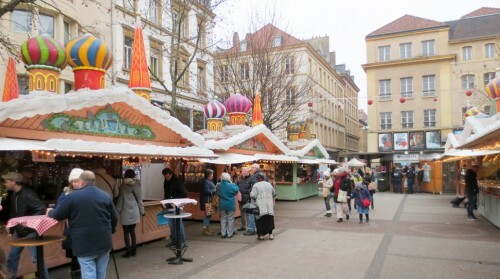 During World War I, French generals promised the residents of Alsace-Moselle that the old agreements, which recognized and supported four main religions, would remain in effect under French government. When Alsace and Lorraine rejoined France in 1919, judicial authorities ruled that the law of 1905 did not apply to the recovered regions. The subject has been under occasional contention for more than 100 years. In the meantime, the exception has become a matter of local practice and even pride. Hence the remarkable Nativity scene in front of the central train station of Metz. We made our way from there to the first of the real markets, on Place Saint Louis. 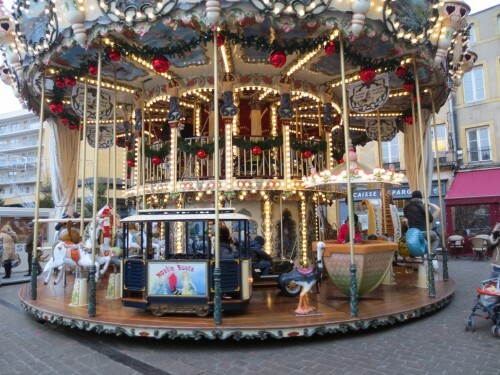 Many of Place Saint Louis’s buildings still have medieval façades, but they are obscured by a double-decker carousel on one end, a Christmas pyramid on the other, and chalets in between. 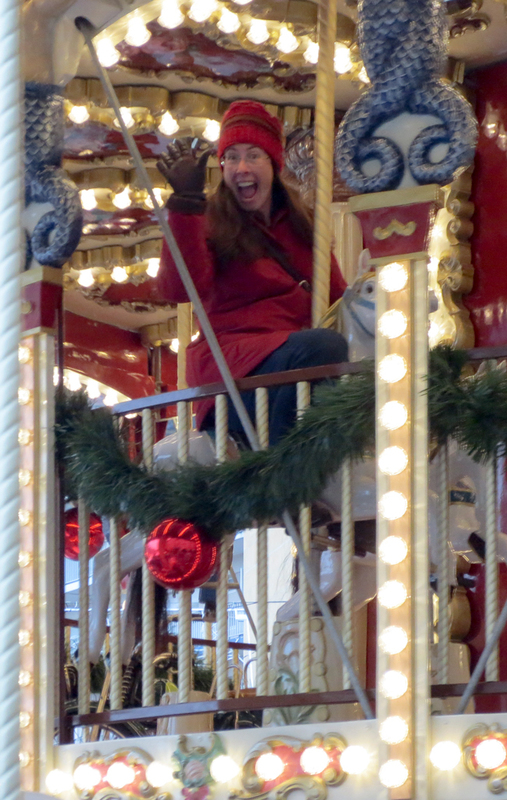 Anita had to ride on the upper deck of the carousel, of course! 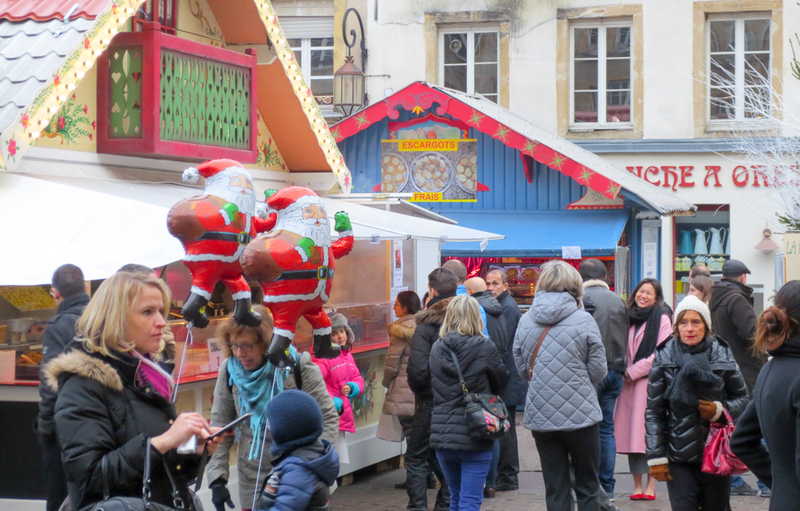 The chalets of this market had the widest variety of food and goods that we’ve seen outside of Strasbourg and Cologne. 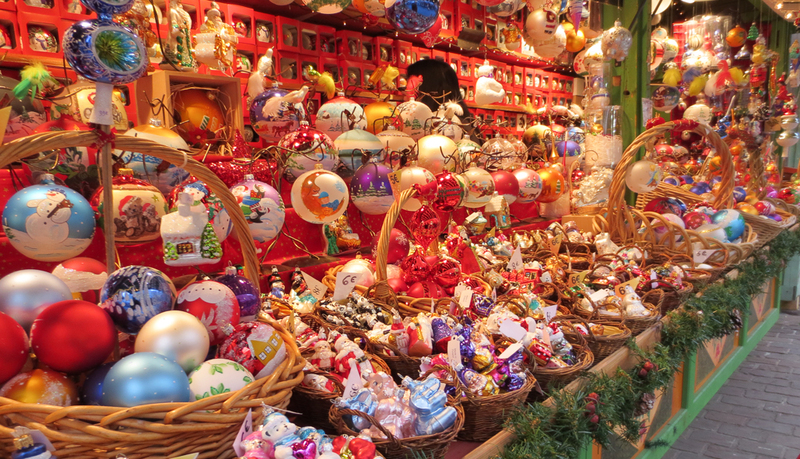 They included some regional specialities that you won’t find in German markets, too. Have you ever eaten fresh snails or frogs’ legs from a street vendor before? We were thrilled to re-discover a type of French candy that we’d happened across in Strasbourg, three years ago. What’s more, we now know where we can find it again — and we can visit on our next trip to Alsace wine country! 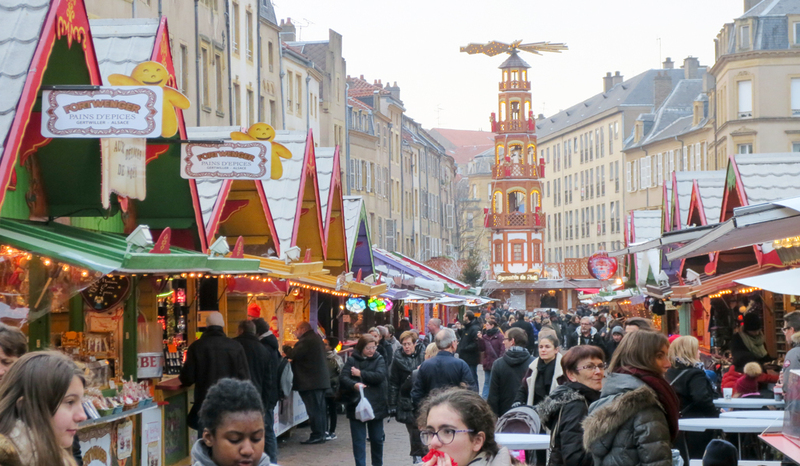 The next market was in Place Saint-Jacques. 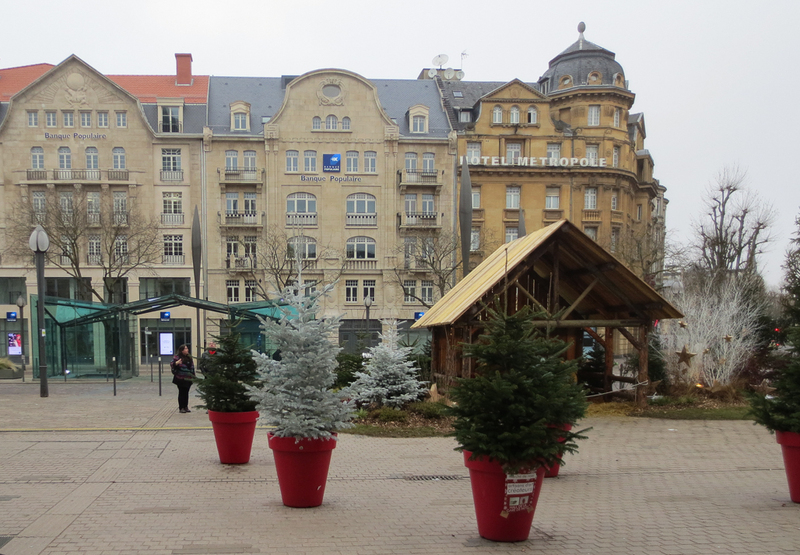 We have no idea what motivated the onion-domed theme for the chalets. We do, however, know a lot about the unusual statue looking over the square. 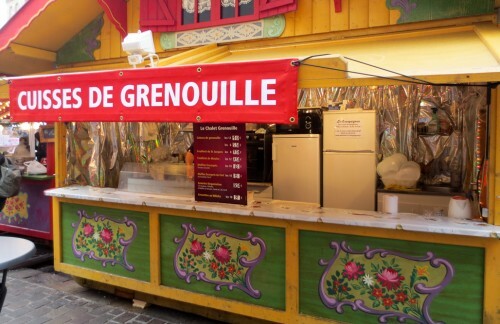 It is emblematic of the unique history of Alsace and yet another exception to laïcité. In 1918, the Catholics of Metz feared that their city would be destroyed, as was the case for neighboring Verdun. They asked their bishop to pledge to build a statue to Mary so that the city would be spared. The statue was erected in 1924. In 1940, the German occupying army prohibited any kind of assembly. Yet on August 15, a crowd gathered to pray at the foot of the statue for the feast of the Assumption of Mary. The feast is now celebrated by a procession to the statue on August 15 of every year. The third market was on the huge and wind-swept square of Place de la République. The main attractions there were an ice-sculpture exhibition and a skating rink. We were getting hungry and had little interest in those things. 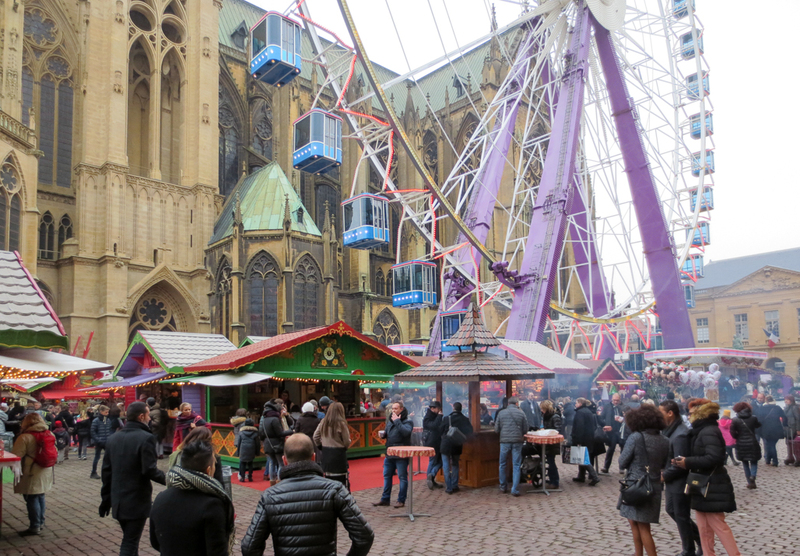 It was almost time to eat but we had one more market to visit first: Place d’Armes, with its massive Ferris wheel next to the magnificent Cathedral of Saint-Étienne de Metz. We have to admit that, with cold hands and empty stomachs, we decided to take a ride next year and visit the cathedral some other time. 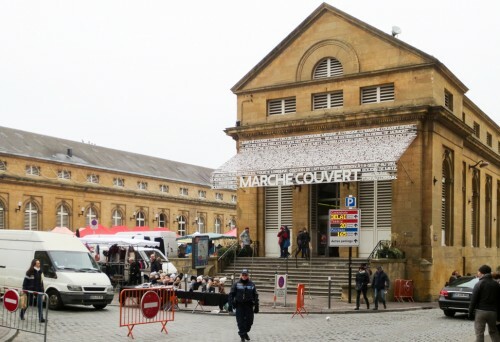 Fortunately, we were very close to the famous Covered Market of Metz. 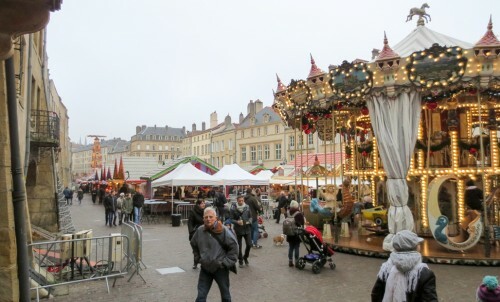 The U-shaped building was begun as a grand palace for the bishop (excuse me, “Prince-Cardinal”) of Metz… just before the French Revolution started. The bishop skipped town and his successors over the years had better sense than to finish the structure. 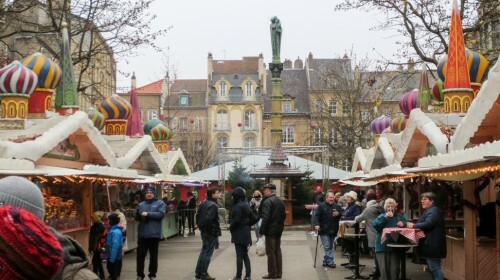 The residents of Metz decided that it was better used as an indoor market about 30 years later. As we made our way back through the markets to the train station, we noticed that the crowds were getting bigger as the sun set. 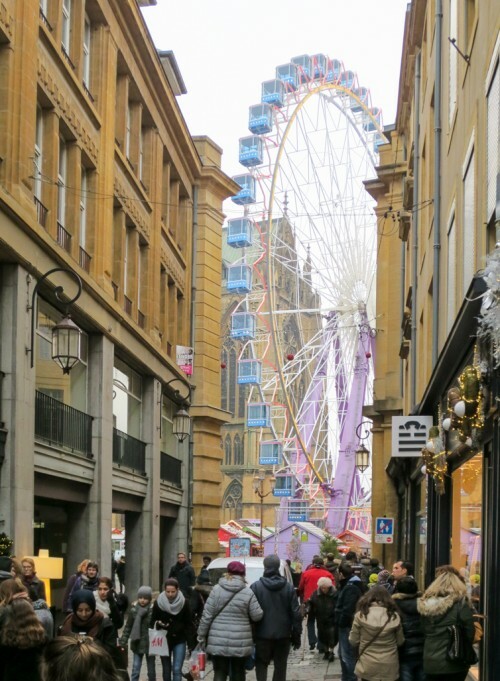 To remember for next time: come later and start with the Ferris wheel! Sounds like fun. Thanks for the historical background. Very interesting! Nous vous proposons différentes solutions de prêt jusqu’à 500.000 € ( avec un faible taux de 3% ) , pour financer tous les projets qui vous tiennent à cœur.